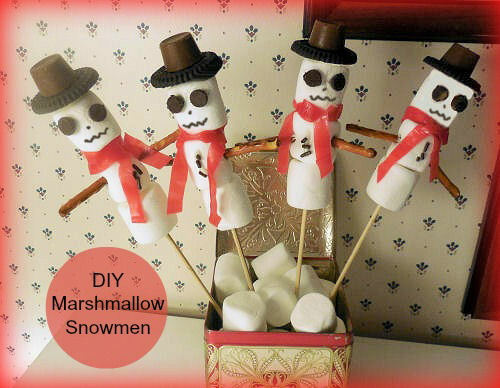 These DIY marshmallow snowmen are so cute and are not just a sweet treat. 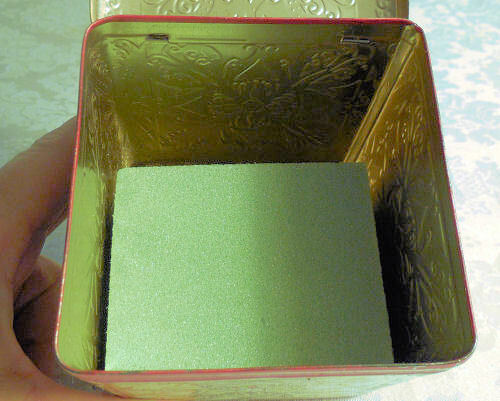 Add a decorative tin the way I did and you also have a cute Christmas decor project. They have sort of a Nightmare Before Christmas look to them. I love doing projects where the kids or grand kids can take part. The project is easy enough so that much of it can be done by your child. Only a few of the finishing touches will need adult supervision. 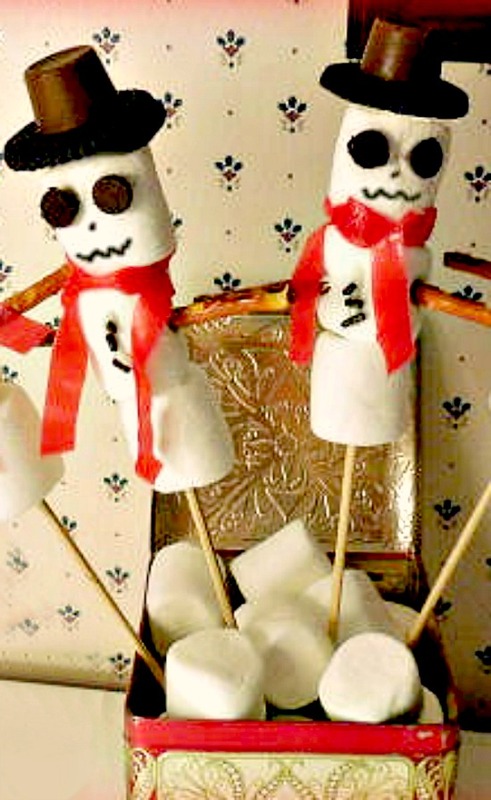 When the project is finished, you can eat these cute guys, or prop them into a decorative Christmas tin to add some fun holiday decor to a side table or kitchen counter. 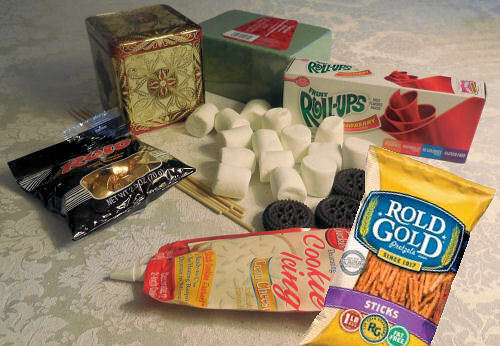 Assemble your supplies. You will need the following items (these are links to Amazon, but check your local Dollar store too. They have lots of items that can be used in craft projects this time of the year. Small oreo style cookies (I used a sugar free version that was smaller than normal oreos, so the hat was a better size. A decorative tin. I used an old tea container that had the colors I wanted. Small piece of floral foam. Start by placing the foam into your container. I cut an extra piece to make it fit well. 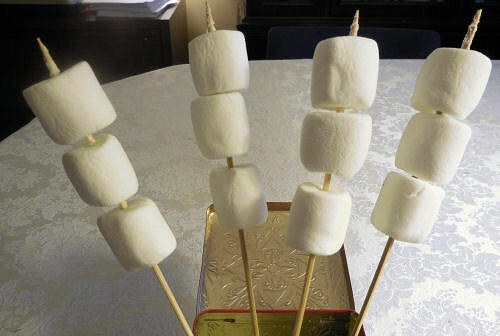 Thread the bamboo skewers with three marshmallows. Have the pointed end up on the top. Insert the other end of the skewer into the floral foam. 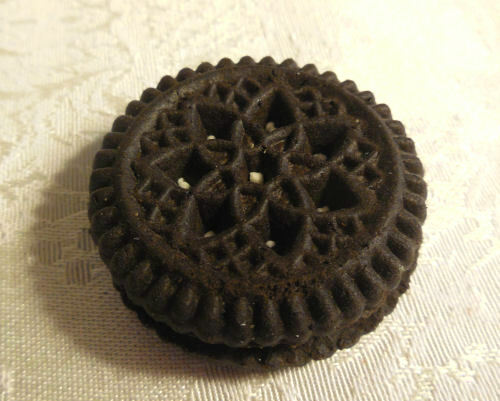 These are the cookies I used. They have a center hole which is perfect. Split the cookie in half and be sure to have some frosting on both sides. 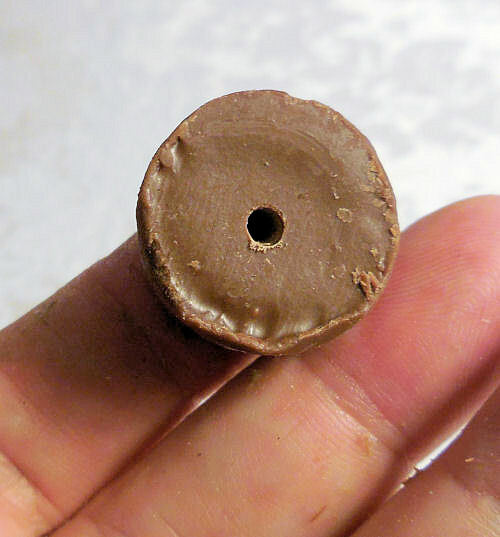 Make a small hole in each rolo candy. 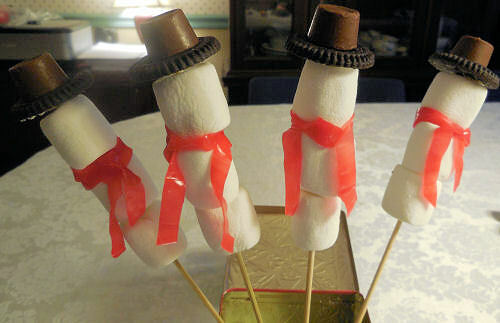 Thread 1/2 of the oreo on top of the skewers and place the rolo candy on top. Squish them down so the frosting touches the top marshmallow. 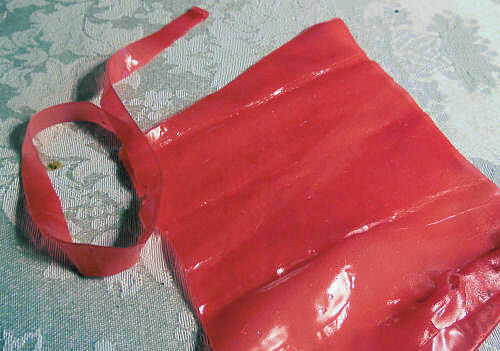 Cut the fruit roll up into very thin slices. I used two pieces for each scarf. Just press the edges together. Wrap the scarf around each snowman’s neck. 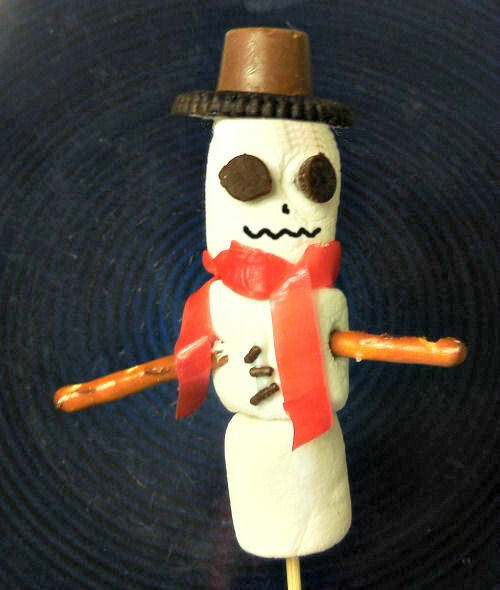 Add pretzel arms (one half for each) and press chocolate chips for eyes. A bit of vanilla frosting and some sprinkles makes the buttons on the chest. Use chocolate icing for the nose and mouth. Add a few marshmallows in the tin to look like snow and you are done. An edible and sweet decorative Christmas accent. This collage shows the process step by step. Super easy to make and one that the kiddos will just love. 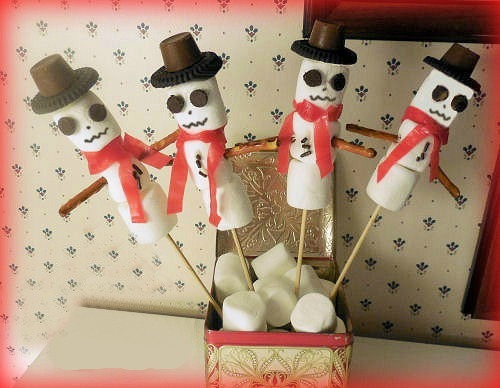 Do you ever experiment with food products in your holiday decor? What have you done? I’d love to hear about it in the comments below. 1 decorative tin. I used an old tea container that had the colors I wanted. 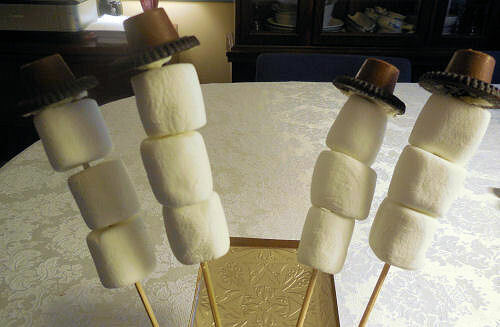 Place three large marshmallows on each skewer. Separate the cookie and use the part that has frosting on it for the base of the hat. Push down so it touches the top marshmallow. Add a dab of frosting and secure the rolo candy on the top to make the hat. Cut the fruit by the foot into lengths and tie them around the snowman head for a scarf. Place a dot of vanilla icing and attach two mini chocolate chips for eyes. Place vanilla icing on the body and add sprinkles for coal. Use a fine icing tip to add a mouth and nose. Push two small pretzels into the sides for arms. 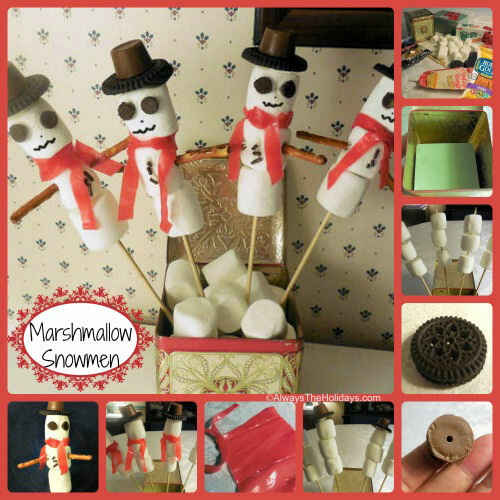 Push the skewer into the foam in the container and add some mini marshmallows to cover it.